This course teaches basic conversational Spanish first, then incorporates emergency management Spanish terms and phrases, enabling you to listen to what a Spanish speaker is saying and then respond appropriately. Cultural training is included within the course, to promote a cultural bridge of understanding with Hispanic clients and co-workers. Great for anyone working in the emergency management industry: Emergency Management Services Director, Emergency Preparedness Coordinator, Emergency Services Planning Director, Emergency Management Consultant, Emergency Systems Specialists, Emergency Management Program Director, Emergency Action Specialists, State Emergency Management Program Managers, Emergency Responders, Community Emergency Response Teams, Hazard Mitigation, Public Health Emergency Preparedness, FEMA, American Red Cross, Law Enforcement Officers, Disaster Preparedness Staff, Disaster Relief Services Director, Public Safety Dispatchers, Firefighters, Fire Captains, and Disaster Recovery Managers. This audio course incorporates architectural Spanish terms and phrases, enabling you to listen to what a Spanish speaker is saying and then respond appropriately. Promotes a cultural bridge of understanding with Hispanic clients and co-workers and is great for anyone working in the architecture industry: Architects, Designers, Interior Designers, Architectural Project Manager, Civil, Structural, and Architectural Specialists. Audio course program is powered by Voice Tonality system of learning which increases language retention. You already know a lot of Spanish, and now it is time for you to Awaken the Spanish Within! This course teaches basic conversational Spanish first, then incorporates restaurant Spanish terms and phrases, enabling you to listen to what a Spanish speaker is saying and then respond appropriately. Cultural training is included within the course, to promote a cultural bridge of understanding with Hispanic clients and co-workers. Great for anyone working in the hospitality and restaurant industry: Waiters, Waitresses, Restaurant Managers, Kitchen Staff, Cleaning Staff, Host and Hostesses, Hotel Managers, Executive Chefs, Event and Meeting coordinator and planner, Servers, Line Cooks, Prep Cooks, Dishwashers, Kitchen Managers, Culinary cooks, Bartenders, Catering and Sales Managers, Food Runners, Executive Housekeeper, Executive Meeting Manager, Cafe Manager, Catering Manager, Bus Person, and Chefs. This course teaches basic conversational Spanish first, then incorporates hospitality Spanish terms and phrases, enabling you to listen to what a Spanish speaker is saying and then respond appropriately. Cultural training is included within the course, to promote a cultural bridge of understanding with Hispanic clients and co-workers. Great for anyone working in the hotel industry: Front Desk Agent, Front Desk Supervisor, Front Office Manager, Executive Director, Executive Housekeeper, Reservations, Concierge, Room Service, Operator, Valet, Bellman, House Keeping, Hotel General Manager, Executive Meeting Manager, Wedding Sales Manager and Coordinator, Guest Service Representatives, Event and Meeting coordinators and planners. 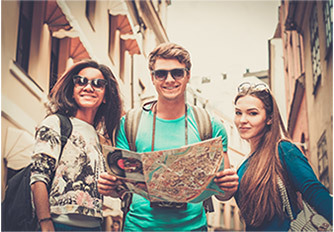 Traveler’s Survival Spanish audio program covers the alphabet, articles, adjectives, some basic foods, some basic grammar, some greetings, some basic conversations, favorite expressions, questions, colors, counting & numbers, calendar, travel vocabulary and phrases. Our Traveler’s Survival Spanish audio program set will give you a strong foundation of the language and is powered by Voice Tonality system of learning which increases language retention. You already know a lot of Spanish, and now it is time for you to Awaken the Spanish Within!